Finally--a recording which truly captures the essence of a live show by this dynamic Southern California ensemble. Celtic / Bluegrass fusion artfully melds with gypsy jazz and country to create an unforgettable listening experience. The darlings of Disneyland‟s “Paradise Garden Bandstand,” this dynamic ensemble presents Celtic Folk (and so much more) with a decidedly bluegrass attitude. 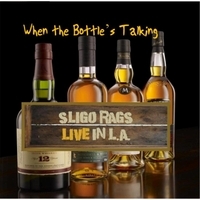 Named among the top acoustic bands in LA (by Folkworks Magazine) and two-time winners of the Orange County Music Award for Best Folk Band, Sligo Rags is taking the local and not-so-local Folk and Celtic music scenes by storm with a unique blend of eclectic musical influences. Dan Miller of Flatpicking Guitar Magazine says “These guys have it all--great vocals, lots of energy, captivating songs, well executed arrangements, and tasteful solos.” Their debut studio recording, "The Night Before the Morning After", was called "the best I've heard from a stateside band" by Celtic Beat Magazine, while their sophomore effort, “The Whiskey Never Lies,” (called “the best from the West Coast Celts in many years” by Shay Clark of the Irish-American News), was named one of the top 10 of 2008 by Folkworks. Don‟t be surprised if elements of country, gypsy jazz, and swing manage to sneak their way into the act as well. Award-winning flatpicking and fingerstyle guitarist David Burns (recently featured in Flatpicking Guitar Magazine), fiddler extraordinaire Michael Kelly, world-renowned bassist Olivier Prud‟homme, and percussion whiz-kid Jonathan Baer are guaranteed to fill the room and your lives with electricity. They may give you a good laugh or two along the way as well.